How Does Technology Have Changed Families? The ability to text your husband from the bathroom to tell him that your 4-year-old used the last roll of toilet paper for an apparent art project and to ask him to send her in with another is a life bonus so many of us could not live without. Technology has changed the concept of family dynamics. Most of us go all day without actually speaking to people on the phone anymore; we just text. When our daughter woke up this morning after daddy already left for work, she wanted to see him so we Facetimed him and she got to see him. She’s confused when we have a phone conversation with someone the old-fashioned way. We have no idea how to survive without technology anymore, and it’s both good and bad. 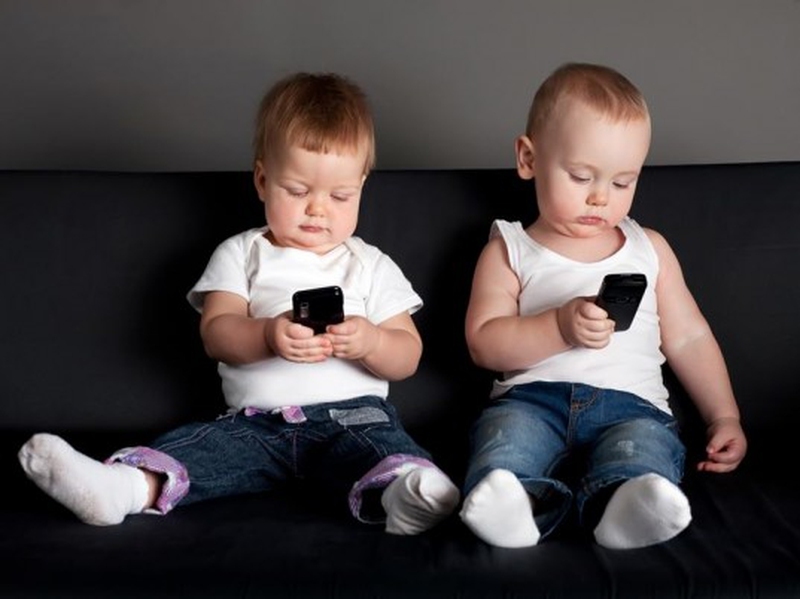 But since we prefer funny, we thought we might look into how technology has changed our families in the most hilarious ways possible; because enjoyment and laughter never change. Most of us can carry on an entire conversation using just emojis these days. For example, as my husband is on his way home from work each day, I can text him the wine glass emoji and he knows immediately it’s been a long day with the kids and he should hurry home to rescue me as quickly as possible. Additionally, the face with the wide eyes is our code for, “Ava is actually going to kill me today,” as anyone who knows and loves our 4-year-old can attest. As someone who really is creeped out by the thought of someone following me around town and standing outside my house watching through my windows when they want to know what I’m up to, I’m oddly comforted by the thought of being stalked online. I mean, totally creepy, but less so than seeing a face at the window, don’t you think? Also, I can now stalk the parents of my kids’ friends to see if that’s a friendship I’m encouraging or one we’re putting an end to before it even begins. There’s a win-win in every situation. Except that time you mention something you saw online to someone you’re not actually friends with online and then they know. Oops. It’s a true story even if we try to pretend it’s not. As someone who only recently decided that I can no longer avoid the hashtag train, it’s happened here. And now life happens and I find myself think in a hashtag. My 1-year-old twins might do something beyond adorable (all day, every day thank you very much) and I’ll find myself thinking “Hashtag Cutest Babies Ever,” and sending texts when someone is crazy to my best friend that read #WhoInvitedHer? Family photos now look like a bunch of strained necks and half faces as we all try to fit into one tiny little shot and hope that the longest arms can capture us all. Who needs to call a professional photographer when we can take our own photos in less than five seconds and go back to what we were doing before we interrupted ourselves for a selfie. Also, our kids know the phrase selfie but our parents are really not sure what it means. When we were kids and our parents had to help us with a book report, we had to bust out the encyclopedias. When we tell our kids that Google is so much better than what we had to do as kids, they have no idea what we are talking about. They’ve never heard the phrase before – lucky kids. Who talks in real life? Um, that would be no one. We no longer speak to one another. We text, private message and we email. Oh, and we sometimes voice to text when we drive and even our phones aren’t sure what we’re trying to say because they so infrequently hear people talk to one another. I mean, how many times have you been at dinner and wondered if the family next to you is texting “Past the salt,” because they have no idea how to form the words on their lips? We don’t have to yell upstairs for our kids when it’s time to get dressed, eat dinner or go. We just send a text – it’s that time. They know it, it’s quiet and everyone is actually really happy with it. God forbid we make the trek up the stairs, get the exercise, use our voices and actually interact with our kids. That would be atrocious. We washed towels in the master bath this morning but forgot to replace them, so we send a quick text to our spouse asking him/her to bring in a fresh set of towels from the linen closet when they get a sec. We are in our home office working away and we want a glass of water, so we text the person in the kitchen. We forgot to get milk on the way home, so we text our spouse to do it for us. Our needs are met, and that’s awesome. When I was a kid, we didn’t even have to worry about caller ID. We could call our parents from anywhere, tell them we’re a certain place and never worry about them finding out we were actually someplace else. Now they can see the location from the cell tower from which we called, they can see our movements and photos online, and we can’t lie anymore. As a parent, I’m okay with that. As someone who occasionally skips out on family dinners with my parents when something better comes up, it’s a challenge to have to remind all our friends NOT to take photos of us and put them online. So, you know, it’s a winning challenge. Server responsed at: 04/18/2019 2:28 p.m.